Address: No.3 St. 3 Yinsha Rd., Shabian village Xiabian community, Changan Town, Dongguan City, Guangdong Province, China. 1. New design, easy operation. 2. South Korean imported temi 1500 controller. 3. Uniform air supply cycle system. 4. Long axis motor is vertically installed on the top. 5. Bright and spacious observation window. 6. Advanced security protection device. 7. Rapid heating-up and heating-down temperature. 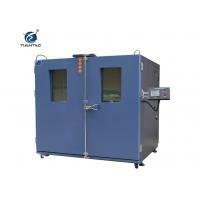 Temperature humidity testing chamber (temperature or humidity) as well as other relevant physical characteristics at low temperature or high temperature condition. Through testing to determine product performance whether it is still be able to meet the intended requirements.